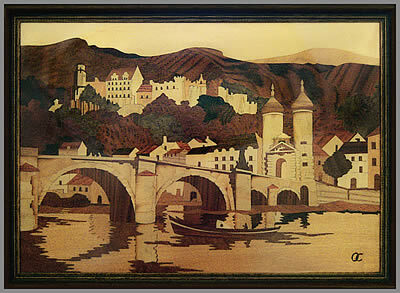 February's update brings you what appears to us to be a rather unusual wood inlay picture of the very popular Heidelberg scene, so often featured in many Buchschmid and Gretaux wood inlay pictures and pieces. 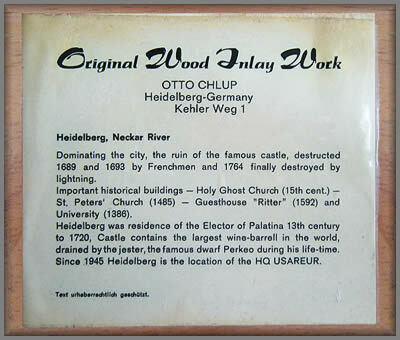 Our February 2012 update brings you a wood inlay picture signed by Otto Chlup rather than the more usual Buchschmid and Gretaux logo. It features that same view of Heidelberg which was so often favoured by Buchschmid and Gretaux themselves. Tammy Marion, the owner of this wood inlay picture, asked for our opinion as to why the picture has the OC (Otto Chlup) logo instead of the standard BG logo. We believe this most likely came about following the passing of messr's Buchschmid and Gretaux. This would have left Otto, as the B & G agent, with an outstanding order book with requests for wood inlay pictures and pieces left to fulfill. As Otto was basically the third member of the team, he would have had legitimate access to all of the original B & G artwork. This, as far as we are aware, is the most probable answer as to why the featured wood inlay picture has an OC logo instead of the BG logo. "I purchased this picture at a second hand store in approx: 2010 in Ottawa, Ont. Canada. I was looking through a bin that they had there, which was full of pictures and paintings and spotted this inlay picture in that bin. It caught my eye because of all the wood, the detail and the scene. And, when I turned it over and read that it came from Germany, well I just had to have it. Part of my heritage comes from Germany as my Mother was born and raised there, so pretty much anything made in Germany is of interest to me. The picture is approx; 18 x 13 inches and the frame was already fitted as part of the picture when I purchased it. It is signed by Otto Chlup. 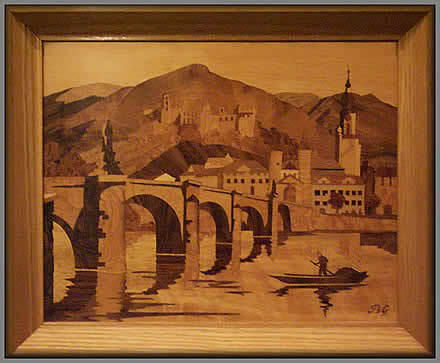 The wood inlay picture, in its entirety as you see it here... is exactly how I purchased it." Click the above button to return to page 35 of "Can You Help"